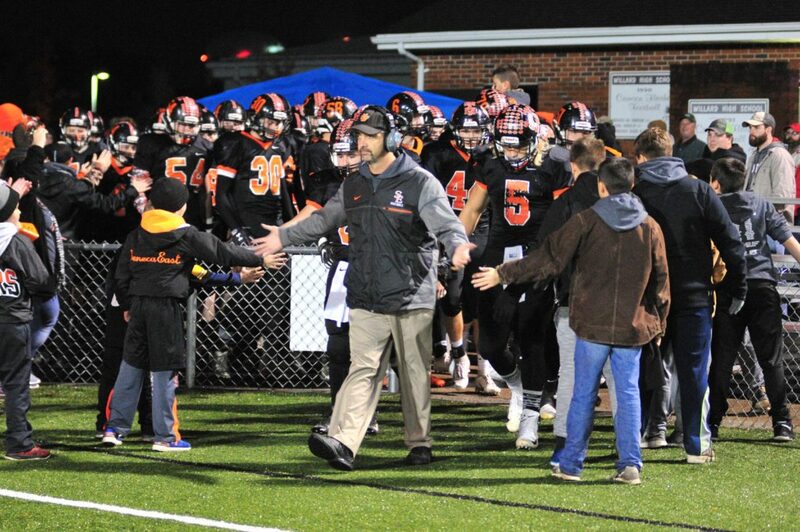 PHOTO BY PAT GAIETTO Seneca East coach Ed Phillips leads his team on to the field Nov. 2 against Loudonville at Willard. Week 12 officially kicks off the neutral site portion of the playoffs, but Seneca East is already at home with that. The Tigers opened the year against Margaretta at Bellevue on a Thursday night after construction issues at the Polar Bears’ stadium forced the game to be moved. Then last week, flooding caused Seneca East to move its home playoff game to Willard. Both times the Tigers rolled to easy wins, dropping Margaretta 41-12 in Week 1 and storming past Loudonville 33-9 last week for the first playoff win in school history. Now, the top-seeded 10-1 Tigers face Columbus Grove in tonight’s 7 p.m. Division VI Region 22 regional semifinal at Tiffin’s Frost-Kalnow Stadium. “We’re pretty used to it now and we like it, we like going to neutral site fields and playing. It’s kind of exciting,” Seneca East coach Ed Phillips said. But that playoff win in school history was new. “We finally got that taste of it. It’s like something you eat — when you finally get that taste of it and it’s pretty good, you want some more,” Phillips said. “Our kids, we had a blast last week. It was a dream come true for a lot of people. When you have a dream that’s pretty good, you dream a little bigger and our kids are dreaming a little bit bigger. It’s the same dream for the Bulldogs (8-3), who started the year 0-2 and had quarterback Blake Reynolds miss a few games with an injury. But that came with an unexpected benefit, Columbus Grove coach Andy Schafer said. “We started the season throwing the ball a lot,” he said. “Then Blake Reynolds, our quarterback, had an injury in about Week 6 and we lost him for a couple weeks and it forced us to run the ball, which was probably the best thing to happen. We really developed our run game. Even with the injury time off, Reynolds averaged 117 yards passing and 31 yards rushing for the Bulldogs, throwing for 10 TDs and running for another 10. Trevor Taylor (23-397) and Gabe Clement (13-335) each had at least 330 receiving yards during the regular season, with Caleb Barrientes (18-249) and Adam Bogart (10-111) also providing targets. Garrett Nemire led the ground game by averaging 91 yards and rushing for 13 touchdowns during the regular season, with Brady Hauenstein (380 yards, 6 TDs) and Colin Metzger (241 yards, 4 TDs) adding depth. On defense, Hauenstein (78) and Riley Schumacher (74) each tallied more than 70 tackles during the regular season for Columbus Grove. Jared Basinger added 12 tackles for loss, Cody Johnson had 10 and Ezra Jones and Hunter Reynolds both chipped in seven, while Barrientes picked off seven passes. “They’re balanced. They’re a lot like us. They can run it well, they can throw it well. They take a fair amount of shots down field, so we’ve just got to be disciplined in all the aspects of our defense,” Phillips said. “They’re probably the most balanced team we’ve seen all year. I think that’s probably what jumps out at you. And Schafer said the Tigers have a good weapon with which to counter — Blaine Swartzmiller. “I don’t think it’s any question, it’s their running back. He’s very good. He’s a physical kid, he’s big, he’s strong, he runs with some passion,” he said. “And I think their offensive line does a very good job, so I think defensively we’re going to have our hands full. Swartzmiller enters tonight with 2,067 yards and 25 touchdowns on the ground, giving him nearly 188 yards and more than two TDs per game. Meanwhile, Chase Foos has thrown for 1,491 yards and 16 scores, with D.J. Ruffing hauling in 29 passes for 329 yards and a touchdown while Kane Lynch has 17 receptions for 310 yards and six TDs. Lynch also leads the defense with 91 tackles while Skyler Walker adds 81 tackles, 22 tackles for loss and 11 sacks. Tyler Turek tops the team with 26 tackles for loss to go with nine sacks, with Swartzmiller adding eight sacks and Logan Hicks tallying another seven. “I’ve got a lot of faith in our players,” Phillips said. “We just want to go out and do what we’ve done all year, because we’ve played a lot of good football teams this year and I think the mark of a good team is when you go out on a Friday night, regardless of who you’re playing, you just go out and do what you do and be who you are.